Governor Culver announces budget cut plans. Governor Culver has delivered a sort of ultimatum to unionized workers in the Departments of Corrections and Public Safety: agree to pay reductions or hundreds of employees in those departments will be laid off. Culver also today ordered over 3000 workers in the executive branch of state government who are not covered by a union contract to take seven days off, without pay, over the next eight months. Culver held a news conference at the statehouse Wednesday afternoon to announce his decisions on a variety of budget-cutting fronts. But the focus was Culver’s push to reopen the contracts that three state unions have negotiated for the current year, a process that might yield reductions in pay or other benefits. Danny Homan, president of AFSCME Council 61 — the union that represents the largest share of state workers, issued a written statement, saying the union has agreed to “meet with the Governor to begin holding discussions for the sole purpose of reducing layoffs.” Homan said he is “unsure where the talks will lead,” and can’t say much more about the private negotiations. Culver has set Friday, November 6 as the deadline for the leaders of the three unions to make a decision on their current contracts which outline pay, benefits and other on-the-job issues. Culver ordered a 10 percent, across-the-board cut in the executive branch of state government earlier this month. Last week, state agency directors submitted plans which called for laying off nearly 800 state workers. Two-thirds of the proposed layoffs came in the Department of Corrections. Culver has approved most of the plans for other state agencies, but indicated he intends to ensure some cuts are restored for programs that help poor and elderly Iowans. The governor today approved plans that will lead to layoff notices for about 180 state workers. 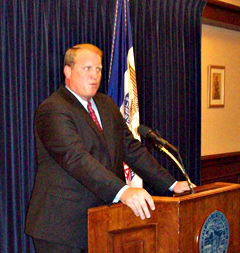 Read more about Culver’s news conference.